My horse, Rosie, lived without food, water, or a fence. I didn’t need to muck her stall or busy myself with her training. She was always available for a quick trip to the bridge or tree house. Sometimes she looked very similar to my blue bike. Other times, she galloped along in my flip flops. She lived on 40 acres in Colorado, but could roam anywhere in the world. Oh. Rosie? She existed entirely in my imagination. And I loved her dearly. I still do. In fact, I feel a little bad about letting the world know she doesn’t really exist in the flesh. But, seeing as she’s about 40 years old now, maybe she will understand. I was Poppy-Suzie and had a talking horse named Rosie. Poppy-Suzie and Rosie enjoyed many sunny days romping about down at the barn, hanging out in the tree house, exploring the scary bridge (we would both freak out and gallop back to the house when the Ghost Cats would begin rummaging about in the old wood). I would “drive” the old rusted car on our property, Rosie patiently waiting alongside until we arrived at our destination. When Dad burned ditches, we galloped crazily through the smoke, important missions in mind. These are some of the fondest memories of my childhood. I had so much fun, running around with my imagination in full gear, creating and solving invented problems. Singing and dancing to a crowded, appreciative audience, teaching to a full class of interested students, building a fort of blankets and taking care of the world, I played happily every day. I wonder where I would be without the imagination that carved out those days for me. And further, if a child from age one and up spends the majority of his/her time with an Ipad or Iphone? What does that do to their development? My childhood was amazing. Filled with wonder and discovery. I’m not saying it’s wrong to have the Ipads, but it is wayyyy different. And it is bound to have a substantial impact on children now. My generation, maybe one of the last who played outside and lived a magical imaginary life, can bring to our grandchildren (though I’m too young for that yet, of course) the wonderful world of imagination outside of a tablet, phone, or Ipad. 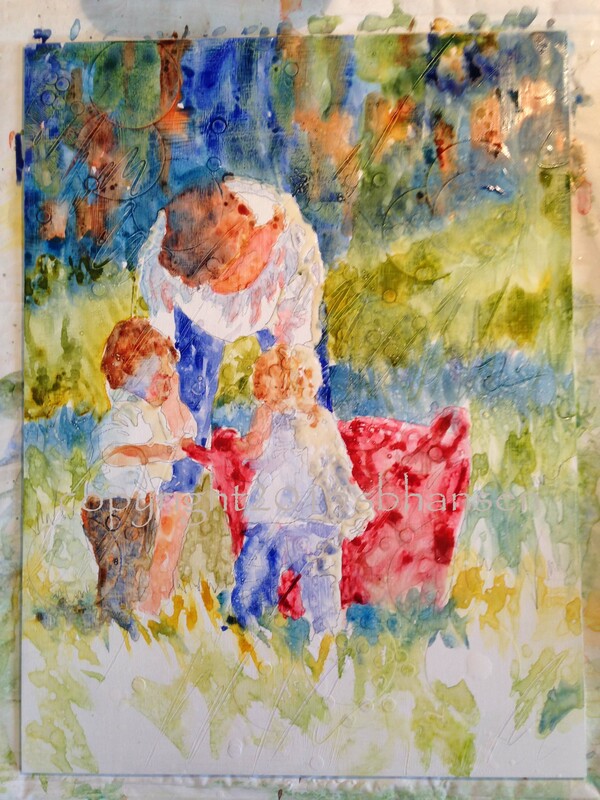 My painting this week illustrates the importance and connection of imagination. My husband’s cousin, caught in the cross-hairs of my camera a few summers ago while she played an imaginary game with her grandchildren, is the subject. The game involved a big red bucket of toys, both imaginary and real. I began with the photo and a thumbnail value sketch. I had adhered bubbles of imagination to the surface of the canvas, symbolized by small circles from a hole punch. Larger paper circles fill the canvas with a random pattern of texture. A quick wash began the transformation from a line drawing to a painting. I focused on keeping the painting loose and colorful. 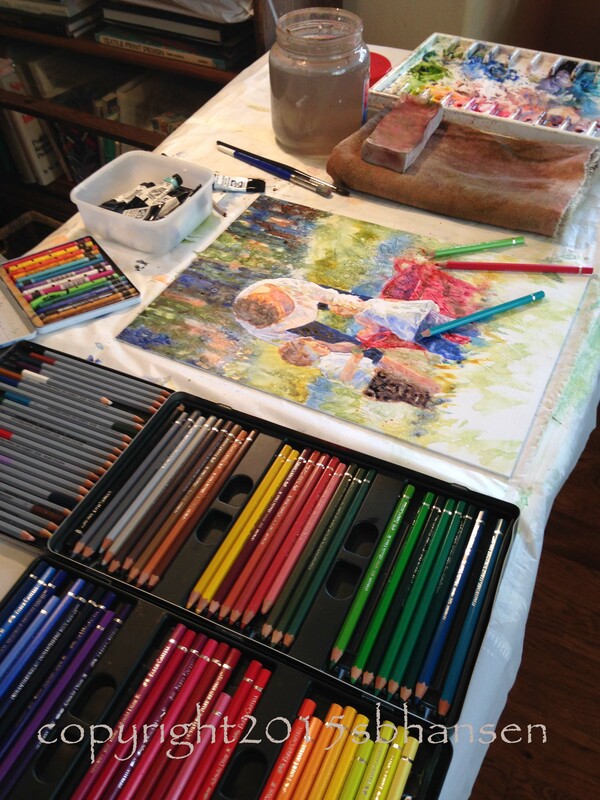 After the painting was 95% finished, I worked in lines and definition, using watercolor pencils. 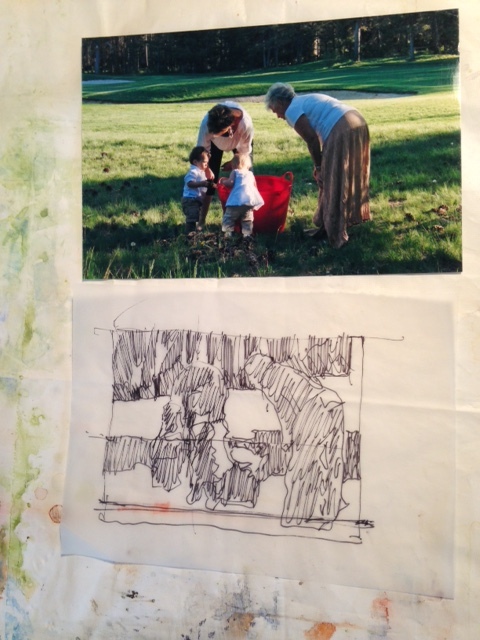 Grandma and the Big Red Bucket, 16×12, watercolor and watercolor pencil on gesso-covered plexiglass. By adding splatters of light and water within the paint, I added to the magical feel of this painting. There is a glow of late afternoon light coming from west, lighting up the white shirts of all three figures. The red bucket has smudged edges, indicating that imagination is not always defined from real life. The boy is wondering what his older sister has planned, and looks on, with a small toy in his hand. 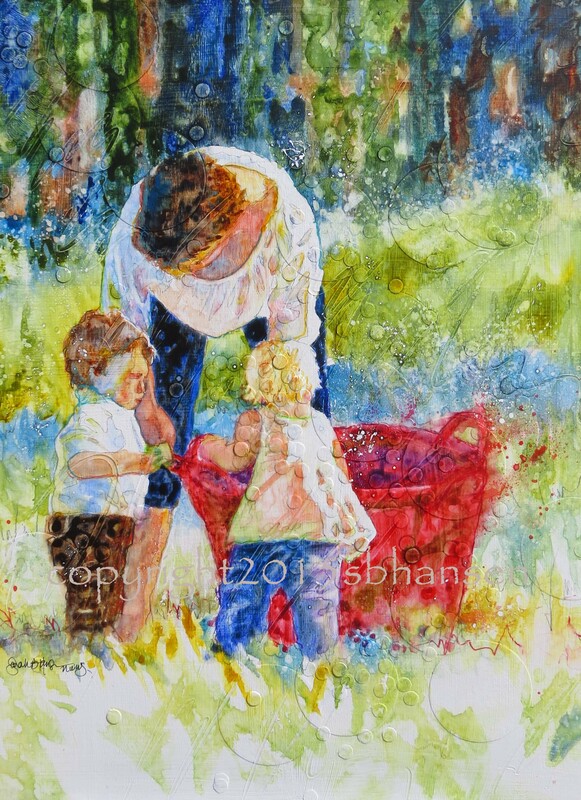 Grandma is gently guiding the imaginations of the two, creating play and interaction with the toys in the bucket. The foreground and background is undefined, letting the viewer imagine the surroundings of the three figures. This painting is more about evoking a feeling of imagination and connection than perfectly articulating each figure and space.